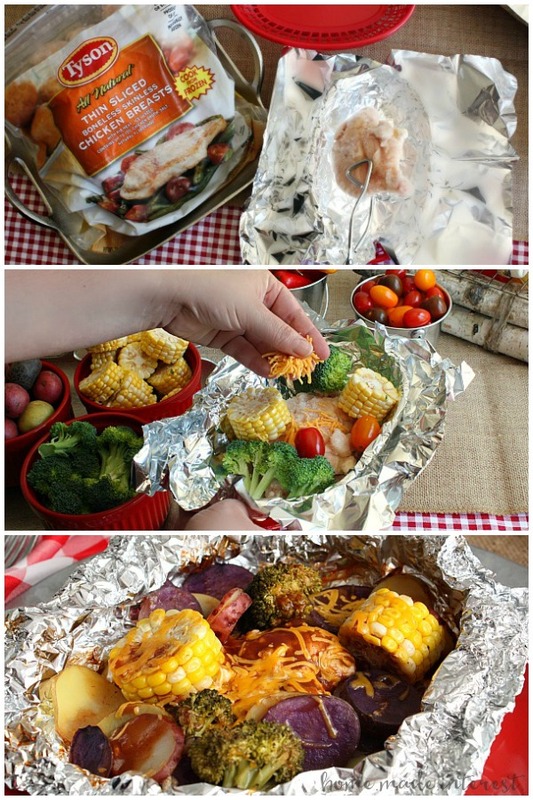 Cheddar BBQ Chicken Foil Packet Meal for a Camping Party - Home. Made. Interest. 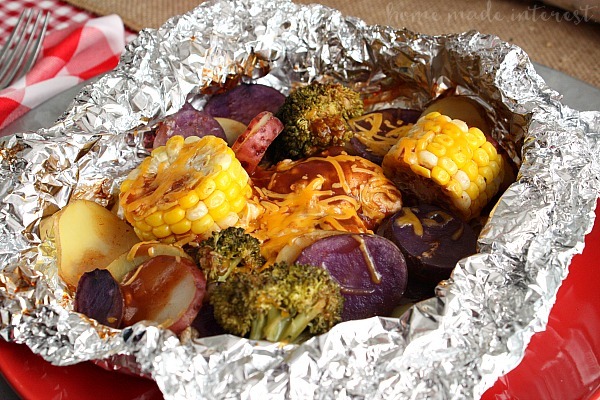 This easy Cheddar BBQ Chicken Foil Packet Meal is the perfect camping food. 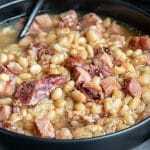 Cook it over a fire or on your grill at a fun Camping party! 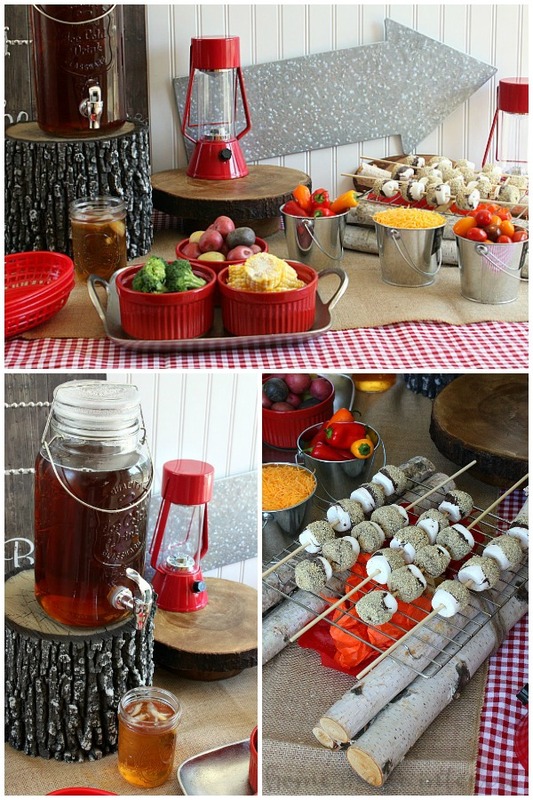 Oh my gosh guys, I can’t tell you how much fun I had throwing this cute camping party over the weekend! Camping is something I really enjoy and don’t get to do nearly enough. In fact, the last time I went camping was before I had my son who just turned 6. Wow, I can’t believe it has been that long. Now that both kids are old enough to really enjoy a weekend in the woods we’ve been talking about taking them camping and they are so excited about the idea of sleeping in a tent, and cooking dinner over a fire, and of course, s’mores. We aren’t quite ready to pack up our gear and head out for a weekend adventure but thinking about all of the fun camping food, and sitting around the campfire inspired me to throw together a little Camping Party this weekend when we had some friends over. I’m not gonna lie the food is probably my favorite part of camping. I love cooking foil packet meals over the fire and toasting s’mores at the end of the night. 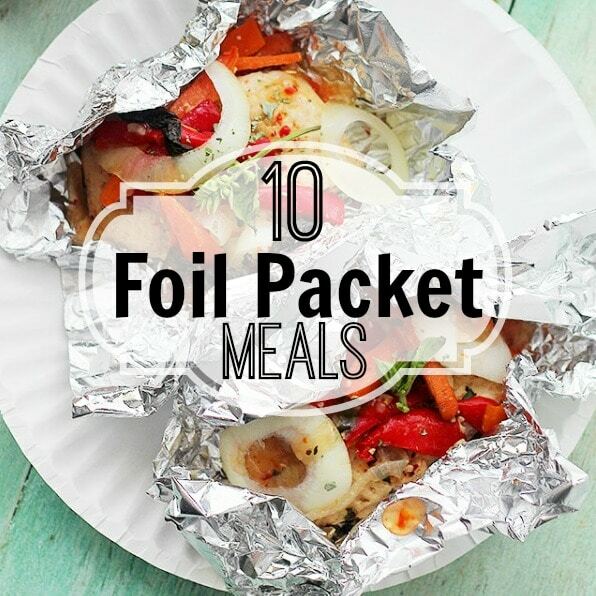 The best thing about foil packet meals is that everyone doesn’t have to eat the same thing. I thought it would be fun to have a foil packet bar where guests could make their own foil packet creations by mixing different toppings with Tyson® Individually Frozen Thin Sliced Boneless Skinless Chicken Breasts. 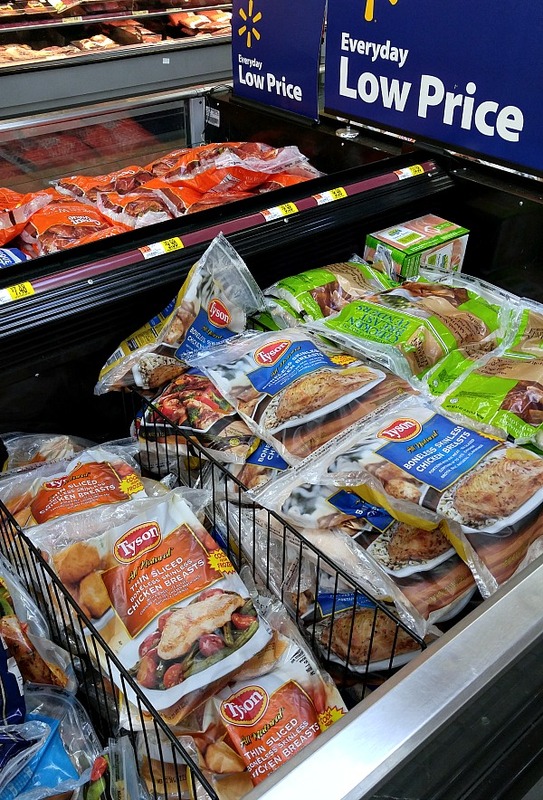 These all natural chicken breasts can be found in the frozen section of the meat department at Walmart. They are individually frozen so you only cook what you need AND they can be cooked straight from frozen so you don’t have to worry about defrosting them. 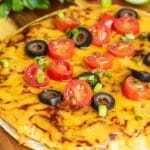 Tyson® Frozen Thin Sliced Chicken Breasts work perfectly for this type of recipe because they are thin-sliced and cook in less than 30 minutes. When it was time to start grilling, I lined burger baskets (those red plastic baskets you get burgers and fries in at some restaurants) with a piece of foil large enough to wrap up a piece of chicken and add-ins, and placed one Tyson® Frozen Thin Sliced Chicken Breast in each. Then guests took their baskets and covered their chicken in whatever veggies, sauces and cheeses they liked. My favorite combination was the Cheddar BBQ Chicken. It is chicken cooked with potatoes, broccoli, and corn covered in BBQ sauce and cheddar cheese. It was soooo good!! 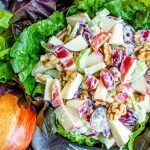 Make sure you get the recipe below because it is something you can make the next time you go camping, grill out, or you can even cook it in the oven! The food table set-up was simple. The rustic look is so in right now it is easy to find all sorts of decorations that look like they came right out of the woods. I used a log as a drink stand and sat my mason jar drink dispenser on top of it. Isn’t it so cute? Walmart has a ton of different options to choose from I had to hold myself back from buying more than one, lol. I used a simple red gingham tablecloth (Hint: if you can’t find one just buy a few yards of fabric at the fabric store it works great!) and layered it with a burlap table runner. All of the toppings for the foil packets were put on the table in red ramekins and metal pails I had left over from a graduation party. My favorite part was this adorable faux campfire. It was super easy to make and it was the star of the party. Since we couldn’t have a real campfire for s’mores, I used birch logs to create my own little fire pit with red, orange and yellow tissue paper and a flashlight. I bundled the birch logs up with some twine and place them parallel to one another. Then I lightly crumpled up the tissue paper and put it between the logs. I nestled two small flashlights into the tissue paper to make it look like my fire was glowing but you could also use electric tea lights. The final piece was the grate over the fire. I used one of my cooling racks and it worked perfectly. 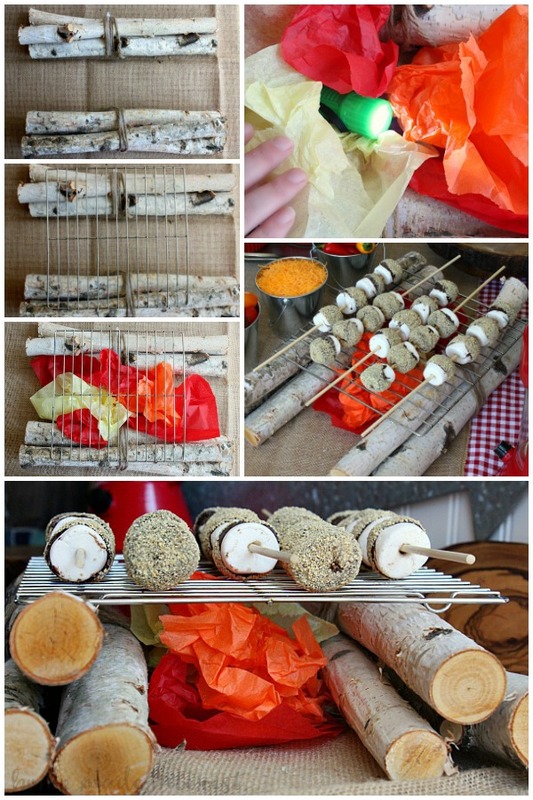 On it I laid my s’mores kebabs. Who says you have to have a fire to have s’mores?! I dipped marshmallows in chocolate and rolled them in graham cracker crumbs. Once the chocolate had hardened I skewered them for instant s’mores kebabs :). The last piece of the party was the dining table. I guess I should have called this a “Glamping” party because we fancied up the usual camping dinner with wooden and galvanized metal chargers, and red plates. My favorite part were the mason jar glasses. I added a strip of burlap around each one and tied it in place with a piece of twine. 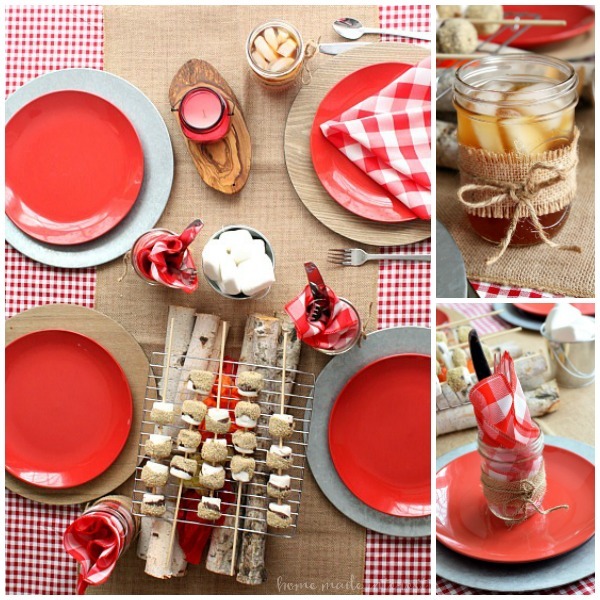 Then I put a red checkered napkin and silverware the jar at each place setting. 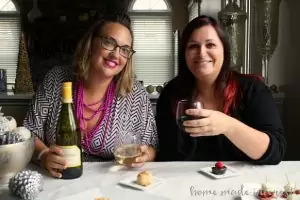 Guests removed the silverware and napkin and then used the mason jar for their drink. I’ll tell you, the most important thing to remember when you throw a party is to be flexible. It took me a long time to figure that out and I still freak out a little when things don’t go as planned. I had this whole party planned for outside on the deck and the day of the party we had 30 mph winds. Not good! I moved everything inside and you know what? We still had a great time! 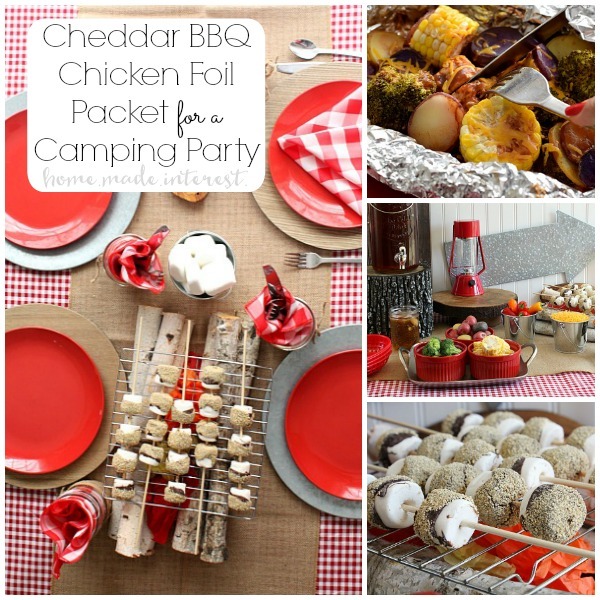 This easy Cheddar BBQ Chicken foil packet meal is the perfect camping food. 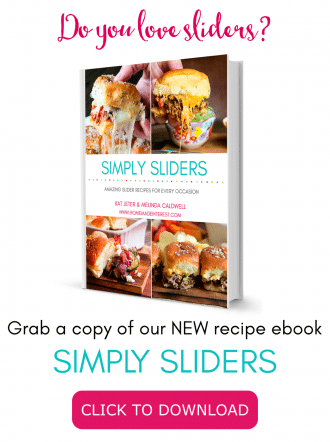 Cook it over a fire or on your grill at your summer parties. 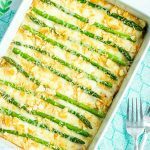 You can even bake them in the oven for a quick and easy weeknight meal! Cut 4 sheets of aluminum foil large enough to wrap around the chicken and add-ins. Place one Tyson® Individually Frozen Thin Sliced Boneless Skinless Chicken Breast on each sheet of foil. 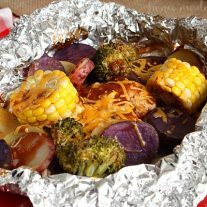 Add baby potatoes, broccoli, corn, and BBQ sauce to each foil packet. Place foil packets on baking sheet and bake for 30-35 minutes or until chicken is cooked through. Open foil packets and sprinkle with cheese letting it melt before serving. 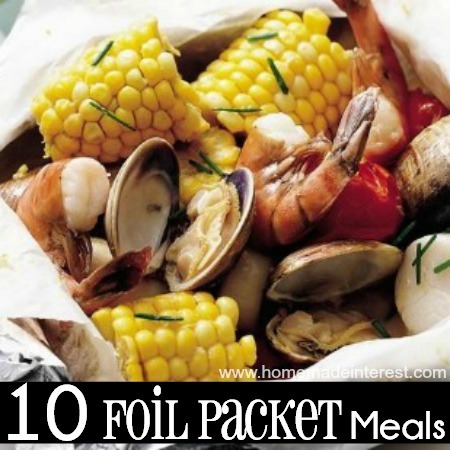 Place foil packets on grill and cook 20-30 minutes or until chicken is cooked through. Look for Tyson® Individually Frozen Thin Sliced Boneless Skinless Chicken Breasts in the frozen section of the meat department at Walmart! Sounds like my family will love it.